In the past, the production of professional quality corporate videos was delegated to outside agencies. Corporate business units hired marketing firms and video production houses because those outside agencies were the only ones with both the required expertise and the expensive equipment needed to generate high-quality results. 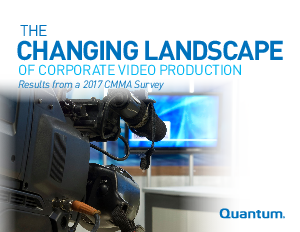 Quantum teamed up with the Communications Media Management Association (CMMA) to survey their members—media production managers from leading enterprises—to learn more about the benefits and challenges of creating video in-house. • Will in-house creative teams continue to ramp up in production? • What video formats are they currently producing and delivering? • How are they archiving their content? • What challenges are in-house teams facing as they generate more content?